Cedar Flats Natural Area is a preserve set aside to protect an excellent collection of 650 year old trees along the Muddy River. 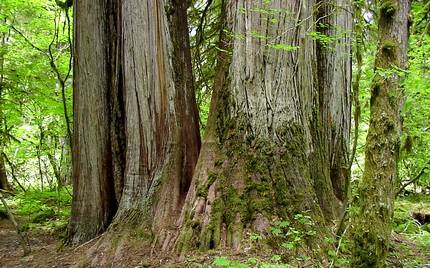 There are Western Red Cedar, Douglas Fir,	and Western Hemlock. The trail provides a small loop through these ancient trees where you can walk, and see, and smell, and feel what it must have been like in this valley so very long ago. From Woodland follow SR 503 and the Lewis River Road for about 48 miles to the community of Cougar, WA. From Cougar, continue east on the Lewis River Road which will turn into Forest Road 90 after you enter the Gifford Pinchot National Forest. In about 18.5 miles you will come to the junction of Forest Road 25. Forest Road 90 makes a right turn, downhill at this junction, but you will need to continue straight ahead on what is now FR25. It is about 3.6 miles from this junction to the parking area along FR25 for the Cedar Flats Natural Area. 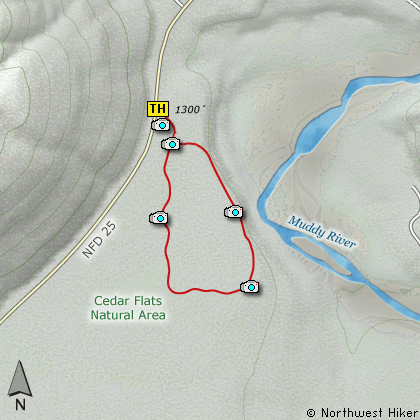 If however, you plan to approach this hike from the Columbia River Gorge area, then begin at Carson, Washington and head northwest on the Wind River Hwy. In 7.5 miles you will pass through the little community of Stabler, and in another 5.8 miles you will come to the junction of Forest Road 30. Turn right onto FR30 and follow this road for 13.2 miles north along the Wind River and then up a steep incline and onto a plateau where	you will come to the junction of the Curly Creek Road. Turn left onto the Curly Creek Road and follow it downhill past an excellent view area for about 5.1 miles until you come to Forest Road 90. Turn left onto FR90 and follow it for about 4.1 miles. You will descend to and cross the Lewis River then come to the junction with Forest Road 25. Make a sharp right turn onto FR25. It is about 3.6 miles from this junction to the parking area along FR25 for the Cedar Flats Natural Area.